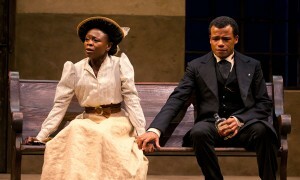 “I was thinking one day, and I was like, I want to make a play that’s sort of … an adaptation of Pygmalion, about Zimbabwe, because I just feel like there are so many parallel themes,” says playwright Danai Gurira in an NPR interview, whose newest work The Convert is currently holding its world premiere at The Goodman Theatre. This commissioned work began at The McCarter Theatre Center in New Jersey in late January and was transfered to The Goodman in late February. The Convert is exactly what Ms. Gurira described, a play about a woman taken from “savage” roots and made to conform to traditional society. Gurira serves up a well interpreted version of Shaw’s play setting it against a complicated past of Africa’s British imperialization and subsequent rebellion during the late 1800s. Running just shy of three hours long, the tensions steadily rise with each act, which are each punctuated with intermissions. Like Eliza Doolittle, Guira’s main character is renamed “Ester” and taught to renounce her native vernacular in exchange for civilized English only Ester’s transformation is in the name of Christ. Though the play does not portray a single British colonist, the African characters whom are educated, saved, and upright speak a clear and often times confused form of English. There is no shortage of poetry in the language used between characters whether it’s the Queen’s English, African or a mixture of the two. As always, The Goodman Theatre is staging a very impressive cast. This play is primarily a female driven cast but LeRoy McClain’s heartbreaking performance as Chilford, a servent of God, is endlessly thought provoking. The true surprise is Zainab Jah who plays Prudence, a highly educated woman who’s tragic circumstances become the crux of the play. Ms. Jah’s throaty monologues are impossible to forget and remind the audience of the hypocrisy that can often afflict changing communities. Pascale Arman does a terrific job of doing accents on top of accents while maintaing the honest naive devotion to a religion Ester does not truly understand. Good theatre should mirror the problems of our world back to us with insight and confrontation, The Convert does just that. Danai Gurira shows us a world that is not unlike our own, her characters battle with the same problems that are even more present today than many like to admit. First and foremost is the question of genuine faith vs. conforming to the rituals of a perceived superior race. She shows us the prejudices committed on one another even within a marginalized group, the role of women in a society and at what cost is a culture willing to give up its heritage in the name of progress? The Convert, under the direction of Emily Mann is running in the Owen Theatre space at The Goodman until March 25th. Tickets are $32-$18. Half-price tickets are available for the balcony the day of the show and as always student prices are $10 the day of the show. The Goodman Theatre is located at 170 N Dearborn Street Chicago, IL. For tickets locate the online box office or call 312.443.3800.